I’m so glad that it’s finally March, it’s been a long snowy, freezing cold, yucky winter and I’m so over it! So hopefully, now that it is March it will start to warm up but until then I thought I would share my favorite Marshmallow Creme Fudge with all of you today. Isn’t this fudge so FUN!? 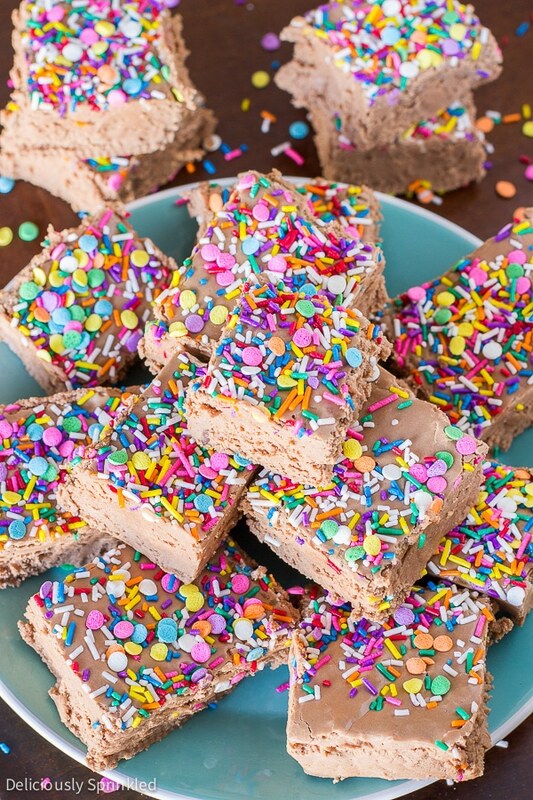 This Marshmallow Creme Fudge is a melt-in-your-mouth, creamy chocolate-marshmallowy fudge topped with SPRINKLES. ● SUGAR: 4 cups of granulated sugar. ● EVAPORATED MILK: 1 (12 oz.) can of evaporated milk. ● BUTTER: 1 cup (2 sticks) of butter. ●MARSHMALLOW CREME: 2 (7 oz.) jars of marshmallow creme. ● CHOCOLATE CHIPS: 2 (6 oz.) bags of semi-sweet chocolate chips. 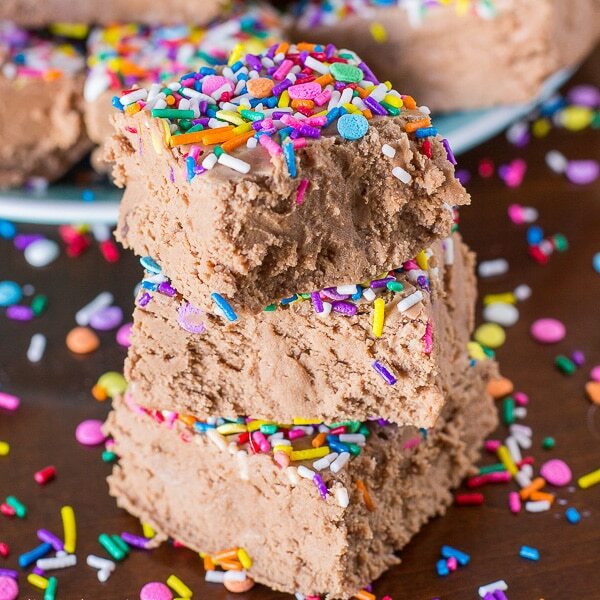 ● SPRINKLES: rainbow sprinkles for topping the fudge. PRE-STEP: Line a 9×13 inch baking pan with aluminum foil and spray with non-stick cooking spray. Set aside. STEP 1: Using a 5 Qt. casserole pan, place sugar, evaporated milk, and butter into the pan and bring to a boil. Boil for at least 5 minutes. Stirring every 2-3 minutes. *If using a candy thermometer, boil to soft ball stage. STEP 2: Remove pan from heat. Add chocolate chips, marshmallow creme, and vanilla extract. Stir until marshmallow creme and chocolate chips are completely melted and smooth. STEP 3: Pour fudge into prepared pan. 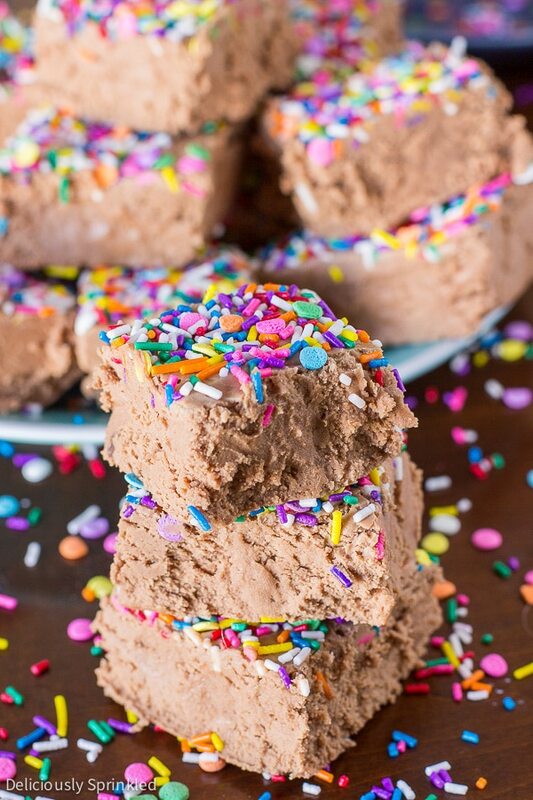 Immediately sprinkle top of fudge with colored sprinkles. Place in fridge for at LEAST 3 hours before cutting into squares. STEP 4: Once fudge is set, remove from pan and cut into squares. DO YOU NEED A CANDY THERMOMETER TO MAKE FUDGE: You don’t need to have a candy thermometer to make this Marshmallow Creme Fudge but if you do have one, it will take the guessing out of worrying if you let the sugar mixture boil long enough. If you don’t let the sugar mixture boil long enough then your fudge will not set and it will be too soft to even cut into. A good rule of thumb is to boil the sugar mixture for at LEAST 5 minutes. 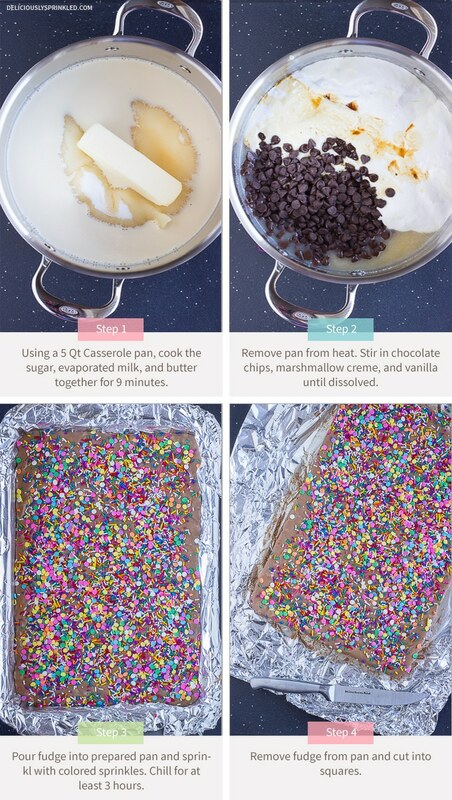 LINE BAKING PAN: To make it super easy for you to cut the fudge into squares, line your 9×13 inch baking pan with aluminum foil, leaving enough overhang on the sides and spray the foil with non-stick cooking spray. HOW TO CUT FUDGE: I find that using a plastic knife works the best when cutting the fudge into squares. 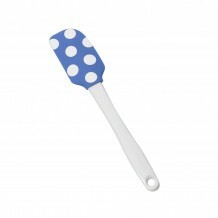 Or spray your knife with non-stick cooking spray to make it easier to cut the fudge into squares. LARGE POT: This is the pot I use to make my homemade fudge. 9×13 BAKING DISH: I love this baking dish for everything, especially fudge. 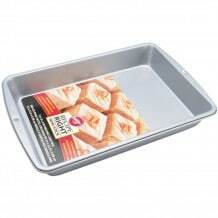 Line a 9x13 inch baking pan with aluminum foil and spray with non-stick cooking spray. Set aside. Using a 5 Qt. casserole pan, place sugar, evaporated milk, and butter into pan and bring to a boil. Boil for at least 5 minutes. Stirring every 2-3 minutes. 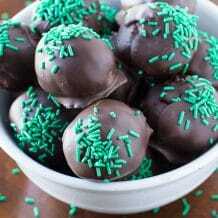 *If using a candy thermometer, boil to soft ball stage. Remove pan from heat. Add chocolate chips, marshmallow creme, and vanilla extract. Stir until marshmallow creme and chocolate chips are completely melted and smooth. Pour fudge into prepared pan. 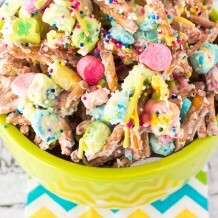 Immediately sprinkle top of fudge with colored sprinkles. Place in fridge for at LEAST 3 hours before cutting into squares. Once fudge is set, remove from pan and cut into squares. * Store fudge covered in the refrigerator for up to 5 days. Thanks, Celia! I used a 12 oz. can of evaporated milk. 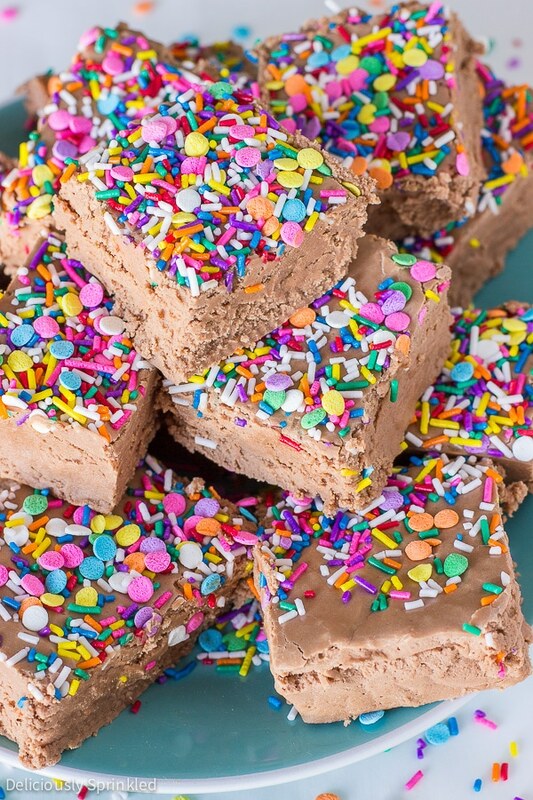 This fudge looks super delicious! I have never had much luck with making fudge before. Your tips are real helpful! Thanks for the recipe, I am inspired to try again! Just got the go ahead from my soon-to-be seven year old – this is definitely what I’m bringing in for her class birthday treat on Friday! Thanks for the inspiration, Jenn! Oh my god the images of this fudge is just making me drool! Love all the sprinkle action going on especially. This fudge looks so pretty. 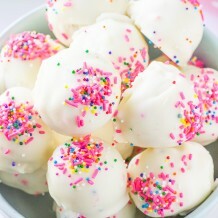 I love the pastel sprinkles; this would make a great Easter dessert. 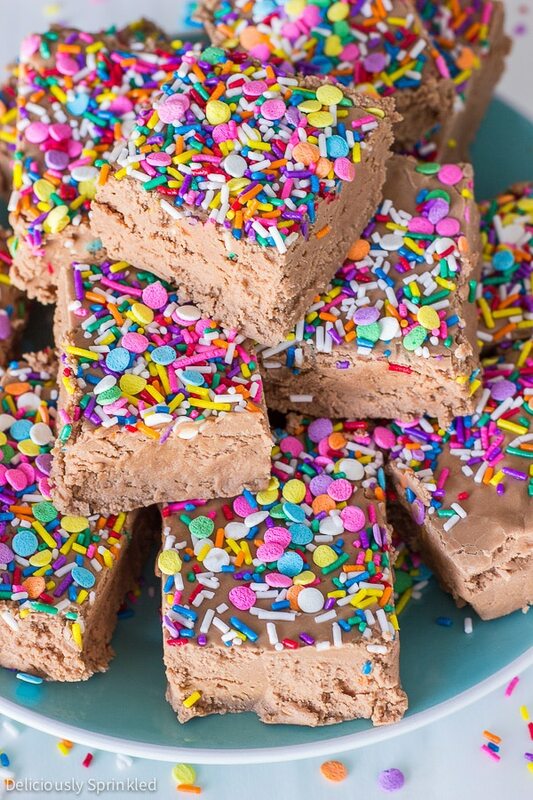 LOVE all of the sprinkles on this fudge, so fun! This fudge looks delish!